Is This The Best Hunting Caliber? 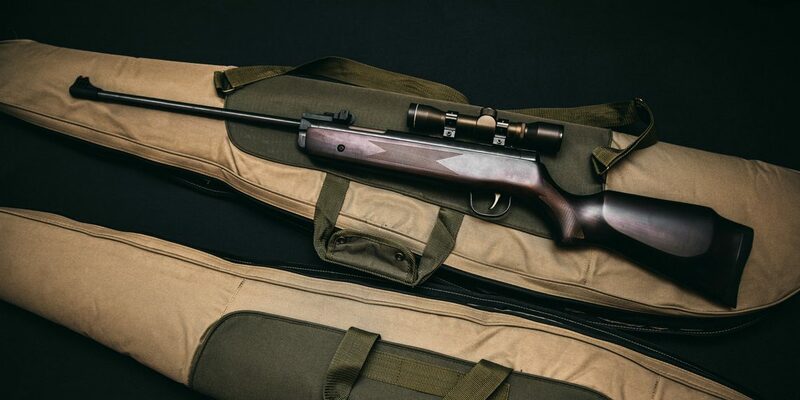 When selecting a firearm to use for hunting, even more important than choosing the gun itself is choosing the caliber that that gun will be chambered for. Guess what: even if you have the highest quality and most reliable and accurate rifle on the planet, with poor caliber selection, it won’t mean anything. This is an ethical issue just as much as it is a practical one: you want to use a cartridge that you know is going to bring down your game with a single shot assuming you hit it in the vital regions (which you absolutely should). There is absolutely no question that the most popular deer hunting caliber of all time is the .30-30 Winchester. The .30-30 is more than capable of bringing down whitetail deer or mule deer, and the fact that it produces limited recoil also makes it a good option for youth or smaller statured hunters. But is .30-30 the best deer hunting round? It depends. For moderate distances of a hundred and fifty yards or less, or as a general brush gun, it absolutely is a good choice. But for longer distance shooting that go beyond the effective range of a .30-30, you’d definitely be better served with a slightly larger round such as the .270 Winchester. The .270 is a high velocity and highly accurate round that is an excellent choice for bringing down deer, and can even be used on larger game such as elk. The best caliber to use for elk will be one that can deliver a lot of ‘umph’ and power at long distances, and the round that fits this bill the best would be the .300 Winchester Magnum. Capable of velocities of nearly 3,500 feet per second, the .300 Winchester Magnum also offers around twenty percent more power than the popular .30-06 Springfield round offers. The one negative downside to the .300 Winchester Magnum is the extra recoil it delivers to the shooter. For smaller statured shooters who hunt elk, a smaller but still powerful round such as the .308 Winchester or .30-06 would be better. Both of those rounds have been routinely used to take down elk. In fact, the elk brought down at the longest record distance from a single shot was taken with a .308. Coyote are significantly smaller sized animals than deer or elk and therefore require a less powerful round. A .223 Remington or 5.56x45mm NATO round is more than sufficient to use for coyote hunting. 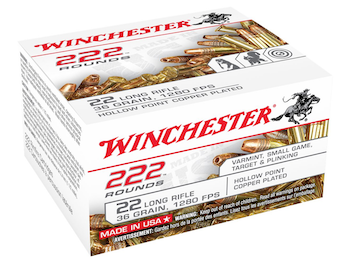 Calibers up to .270 Winchester or .308 Winchester could be used as well, but anything above that is only going to make a significant mess out of it. There are many excellent varmint caliber rounds out there, but two that stand out in particular are the .22 LR and the .223 Remington/5.56x45mm NATO. The .22 LR is one of the most ubiquitous and versatile calibers on the planet, and really deserves more credit than it receives. Commonly underestimated, the .22 is more than capable of bringing down the vast majority of small game. If you would like a rifle with a little more power to it, then something chambered in the 5.56/.223 Remington round would make the best choice, if nothing other for the fact that it’s effective and widely available. You want to go hog hunting? If so, you would be best served by a .308 Winchester rifle, and preferably one in semi-automatic (such as the AR-10 or M1A Scout Squad) so you can get multiple shots off fast, knowing full well the aggressiveness of wild boars. The .308 has more than enough power for the range that you will likely be taking shots, and has light enough recoil to remain on target even if you need to take multiple shots in one foray. There are two calibers that come to mind for bear: the best caliber for bear hunting, and then the best caliber for bear defense. The number one best caliber for bear hunting, without question, would be the .338 Winchester Magnum. This was a round born specifically for the purpose of bringing down brown bear and other big game animals from North America. It is for this reason that the .338 Winchester Magnum is the most popular choice among grizzly bear guides. For bear defense, on the other hand, the best option would be a .45-70 Springfield, and specifically out of a Marlin 1895 lever action guide gun or similar rifle. The .45-70 is a mid-range cartridge with a lot of power behind it, and a lever action carbine like the 1895 is far more wieldy in tight brush while also offering you a higher rate of fire over a bolt action. 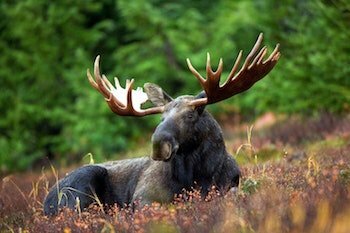 As with brown bear, the best choice of caliber for moose would be the .338 Winchester Magnum. Again, the .338 was intended to be used on the biggest North American game, and it excels at this role. You need a rifle that can travel at fast velocities and over vast distances while still offering enough power to penetrate the hide of the moose and bring it down with one shot, and a quality rifle chambered for the .338 Win Mag will be a rifle that can do just that. Here’s the deal: you’re more than likely not going to need to bring down a big game animal at distances of one thousand yards or more. But if you do want a rifle capable of traveling accurately at those distances, it’s really hard to ignore the .338 Lapua. As a round developed for the military, the .338 Lapua was designed to replace the .416 Barrett and .50 BMG round for snipers. It is also large enough to bring down almost any big game in the world, from bears to moose to cape buffalo, and is held in very high regard by long range shooting enthusiasts. Do you have to use the calibers that we have recommended for each of these respective game animals? No, but at the very least it gives you an idea of the kind of power that you need for each one. 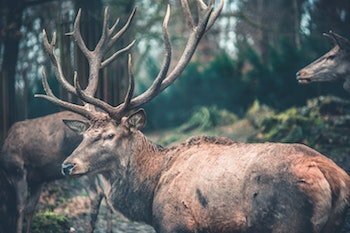 You’ll need a much larger round to bring down a brown bear or a moose than you would a whitetail deer or a wild boar, for instance. And remember, proper shot placement is more important than anything else. Even if you have a more than adequate caliber, hitting your target outside of the vital region is heavily unlikely to bring it down on a single shot. So once you’ve chosen your hunting rifle and caliber, be sure you hit the range before you hit the woods. Copyright © 2018 Gear Lobo | As an Amazon Associate, Gear Lobo earns from qualifying purchases.